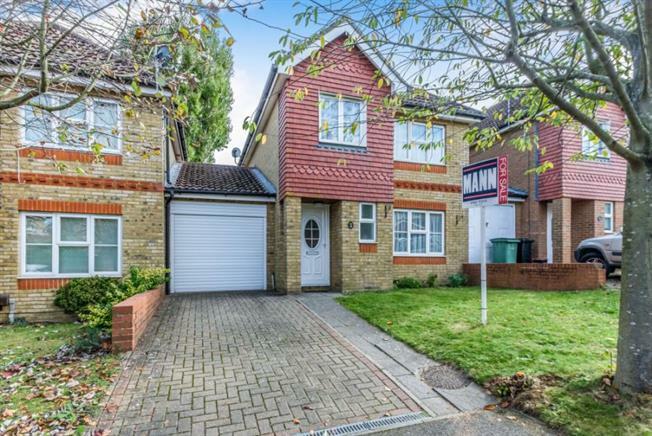 3 Bedroom Link Detached House For Sale in Maidstone for Guide Price £325,000. Guide range: 325,000 to 350,000. Link detached home just on the outskirts of Maidstone. Accommodation on the ground floor comprises: entrance hall, downstairs cloakroom, living room with double doors to dining room, kitchen with separate utility area and personal door through to the garage. Upstairs there are three bedrooms, the main having two built in wardrobes as well as access to an ensuite shower room. The second bedroom has views over the school fields and the family bathroom is also located on the first floor. Outside there is a driveway for a number of vehicles, a rear garden with summer house and shed as well as access back in the home via sliding doors.